The Young and the Restless spoilers tell us that Y&R has made a lot of changes in the past few months and the jury is still out on whether fans have accepted those changes – because the changes have to do with kids on the show that most fans watched be born on the popular soap. Case in point Charlie (Noah Alexander Gerry) and Mattie Ashby (Lexie Stevenson). Y&R SORAS’d the twins to more than double their ages to get the teen viewers involved in watching their favorite CBS soap. One minute they are hanging out with Grandpa Neil (Kristoff St. John) the next day they are almost physically bigger than their mother Lily Ashby (Christel Khalil) who looks about the same age as they are now. Note: Christel Khalil is 29 yrs old in real life. The change was not gradual it was literally overnight. Fans are still trying to adjust to this abrupt change. TPTB at The Young and the Restless have also SORAS’d Reed Hellstrom portrayed by Max Page from 2009-2016. Reed was just a kid when he left to live with dad J.T. Hellstrom (Thad Luckinbill). What a difference a year makes – Reed recently showed up out of the blue as a new worldly teenager, surprising fans and equally surprising his mother Victoria Newman (Amelia Heinle). The new “grown” Reed is now being played by Tristan Lake Leabu. Next on the list baby Katherine Rose (Sienna Mercuri), Victoria and Billy’s(Jason Thompson) daughter. The last time viewers saw her she was still being held as a tiny toddler sleeping in her cradle now she looks like she’s in kindergarten, cute as a button though and obviously not a teen yet so viewers are ok with that SORAS. When fans hear that a soap child has gone off to camp or away to boarding school the soap viewer’s spidey sense kicks in wondering if that child will be an adult when they come back. This fear is definitely the case with fan favorite Alyvia Alyn Lind who plays Faith Newman. Alyvia Alyn Lind has been playing Faith Newman since 2011 and is loved by viewers who have watched her grow up on screen which makes fans feel she is actual family to them. Faith has not been onscreen in quite awhile as her dad Nick(Joshua Morrow) sent her to “camp.” Y&R fans make jokes on social media about how old she will be when she gets back from camp. Will they SORAS her and tie her in with Reed’s crowd? Maybe make her Mattie’s new bestie? Would you be okay with Faith coming back as a full blown teen to shake things up in the new GC teen circle or would you rather keep her small and continue to age gradually on screen? Tell us how you feel do you want Faith back from camp as a teen? Stay tuned to CBS for good daytime drama and stick with CDL as your #1 source for all of your Y&R spoilers, news & more! Sign up for our newsletter by clicking here and get the latest breaking soap news! 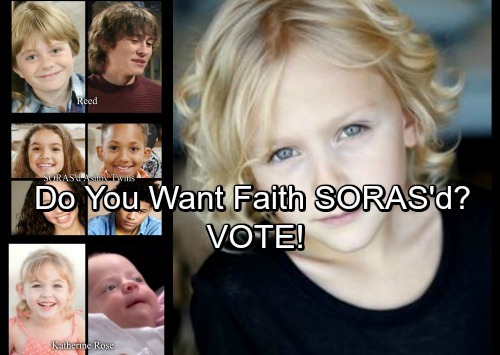 Do You Want Faith SORAS’d?